So after all the brouhaha regarding Fallen Angel , guess which comic I forgot to buy this week? Don't worry, I remembered today. Sheesh. Speaking of which, the pencils for the autographed bookplate (original offer here) are posted on Peter David's website. Jog has a nice review of In The Shadow of No Towers , and a lot more informative than my "well, I'm not sure about the quality of the spine" review. Would you hate me if I said that the stills from the Sin City movie haven't exactly reassured me about the film? Remember that Bush vs. Jesus ad from Mad Magazine I mentioned this morning? Well, apparently it's taken the internet by storm...I've seen it referenced, or outright scanned-and-posted, in about a dozen places so far (like here). If you haven't got your copy of Mad yet, go take a look. I find myself with very little to say about this week's comics. 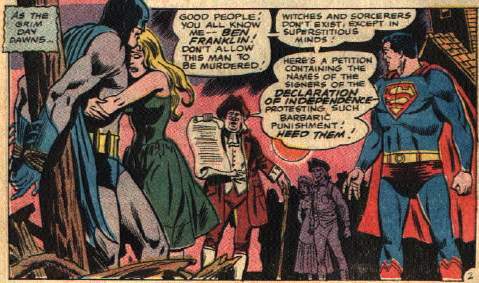 Well, Fables gave us a werewolf fighting Frankenstein's monster, we got some time-travel shenanigans (and another appearance by my favorite Golden Age villain) in JSA , and the relationship between Lana and Superman goes in a direction I really wasn't expecting in Action . The highlight of the new issue of Mad Magazine , #446, aside from the excellent-as-usual contribution by Sergio Aragones ("A Mad Look at Paparazzi") is "The Bush Campaign's TV Commercial If He Was Running Against Jesus." Obvious, yes, but still amusing. Also good is "Your Candidate and My Candidate" ("Your candidate waffles on the issues. / My candidate sees the merits of both sides of the argument.") All in all, another fine issue of this American institution. Some of the jokes have a little dust on them, but hey, so do I. 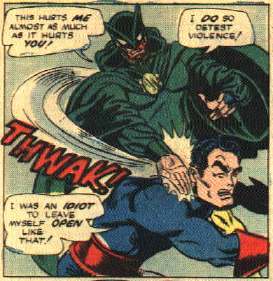 Newest self-contradicting title: Essential Super-Villain Team-Up . Gives me an excuse to link to this old post of mine, though. I jokingly suggested at work yesterday that Marvel should do an Essential Marvel's Greatest Comics , just to screw with people. Chris Karath has one of my favorite comics/media weblogs, but since it's not on the Comics Weblog Update-A-Tron 3000, I'm afraid some comics weblog fans may be missing it. So go take a look, won't you? Also, I finally added The Sock Drawer to the weblogroll. Long day at work (what with it being comic book day and all), and I haven't even had time to read any of my new comics yet. I'm writing this weblog entry instead...see what I do for you people? Anyway, I'll probably have some kind of comics overview tomorrow. We did get in Art Spiegelman's new book In The Shadow of No Towers , and I can say it's a very nice-looking package. The first half of the book, which relates Spiegelman's reaction to the 9/11 attacks and the country's response, is visually very compelling, looking for all the world like one of his old RAW magazines. The second half is classic comic strips from the beginning of the last century, thematically linked to Spiegelman's observations in the first half. I haven't had a chance to read and see for myself if it deserves the mixed critical reaction it appears to be receiving, but at the very least it's visually appealing. My one concern is that the book's spine may not be up to the job of repeated readings...it feels awfully darn fragile. Beaucoup Kevin relates what comic creators he would shag if he were gay. Representative quote: "BENDIS! 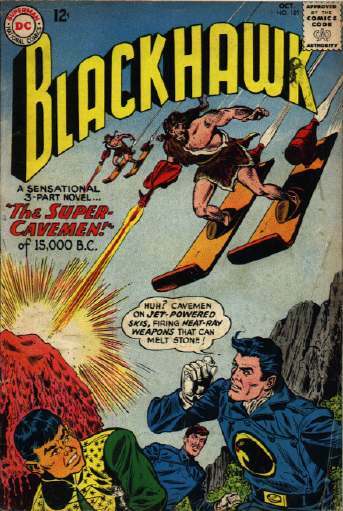 I'd lick his head and send him on his way...."
AiT/Planetlar honcho Big Larry continues his examination of the comicsweblogosphere at Comic Book Resources. Against Lar's better judgment, I'm sure, he continues to include comments from me. Okay, who wants to go in with me on bidding on Crossgen? (PayPal donations gladly accepted.) Related is this story about the creators of the fine Abadazad Crossgen comic trying to get back the rights to that series. Found out from a customer today that cartoonist Jack Lawrence is off the Darkham Vale book he created for AP Comics. However, he has a new forthcoming book entitled Lions, Tigers, And Bears that should appeal to his fans. Just added Jason Kimble's Trickle of Consciousness to the weblogroll, which I probably should have done a long time ago. Found via my referral stats: my favorite page linking to the Seven Deadly Harveys. Milo George, who always delights and baffles, presents The Greatest Flash Gordon Daily Strip Ever. For Scott Saavedra: more Space Canine Patrol Agents info here, here, here (warning: gnarly pop-ups), here, and, because God is good, Space Canine Patrol Agents fan fiction (with special guest-star, Ace the Bat Hound)! If you like the old comic covers, get yourself over to the Viper Comics Raw Feed for some of Greg Gatlin's spicy delights. I have no idea why I just typed the phrase "spicy delights." I apologize. To steal an observation from pal Dorian, everybody may be talking about Amazing Fantasy , but has that translated to sales? The first issue of the British comic Dandy sells for £20,350 (just over $36,000, to us Colonials). You can find the cover and 5 pages from the Cure issue of Rock 'n' Roll Comics on this Cure fan site. Just added to my weblogroll: the mighty Mae Mai, the unique Utopia Moment, and the crispy Christopher Butcher. Johanna's Fallen Angel contest ends today, so go enter, you slackers. If you don't enter (or you enter and don't win) you can always step into your local comic shop tomorrow (REMEMBER: NEW COMICS ARE ARRIVING TOMORROW, not today) and pick up a free copy of Fallen Angel #1. Quantities are pretty limited (retailers are only getting copies equal to half their orders on Hellblazer #200), so act fast. EDIT: Because I'm an idiot, I forgot to put in the link to Johanna's contest page when I originally posted this message. I fixed it now, not that it matters...but I did post the link a couple days ago, so hopefully people saw it there. Sorry, Johanna! In which Mike rambles on about Superman to no good effect. So a few days ago I was listening to a Los Angeles radio talk-show trio who, between talking about stories they say they got out of the newspaper but really just stole from Fark, made a brief mention of the forever-forthcoming new Superman movie. One of the trio said something to the effect of "why are they doing another Superman movie? Haven't they done enough movies and TV shows about him?" And that got me to thinking about a somewhat-related topic...when's the last time anything interesting has been done with Superman in the comics? Now I'm not talking about the Elseworlds or graphic novels or such. 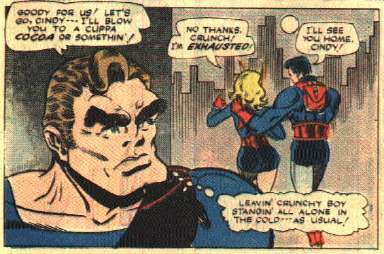 I'm talking about the actual (Adventures of) Superman and Action comic series, the ones that have been published continuously since the 1930s, plus the newer Superman series that began in '86...the series that are published pretty much solely to perpetuate the trademark shepherd along the legend of the Superman character. By "interesting," I don't mean temporary costume changes (like the electric Superman), or storylines (like Supes' "death" and return). I mean significant, permanent changes to the character or to the dynamics of relationships within the books. The most recent change is probably the marraige of Lois Lane and Clark Kent, putting to an end the quintessential comics love triangle. Prior to that was Clark telling Lois that he was indeed Superman, putting an end to one of the primary Superman plot-movers from the last half-century. Before that were what are turning out to be the only two major surviving changes made by John Byrne during his '80s revamp - the removal of Superboy from the Superman story, and the survival of Ma and Pa Kent into Clark's adulthood. 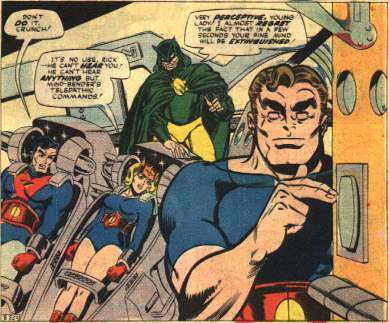 Before that was the decision to make Clark Kent a TV reporter (which he was though most of the 70s into the mid-80s), and before that...the addition of another super-powered Kryptonian (Supergirl), maybe? 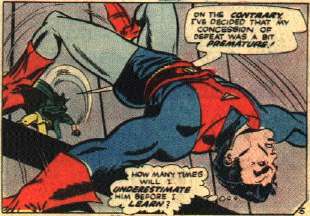 The addition of his life as Superboy? And what will be the next big change? The seemingly-obvious one would be the addition of a super-baby for the happy couple, but that may bend the Superman formula to the point of breaking (and wouldn't bode well for Lois, as anyone who's read this essay could tell you). More likely we'll get another company-wide revamping of the superhero characters, resulting in a "back to square one" continuity for the Superman cast. 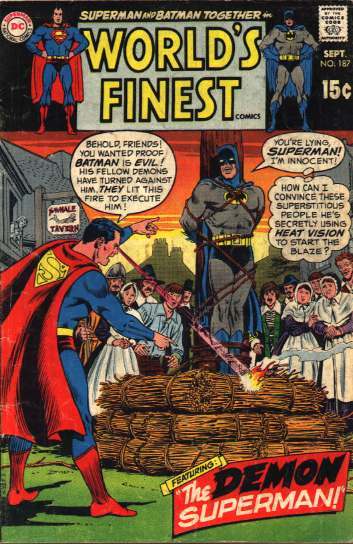 Or, less drastically but still tragic, the loss of one or both of Superman's adoptive parents. In case you couldn't tell, I don't really have much of a point to all this, beyond considering what changes could be made to Superman without interfering with the character's current raison d'etre: merchandising and other mass media tie-ins. * This brief list doesn't include the cartoons, or the pilots for the Superboy and Superpup shows (from 1961 and 1958, respectively). And, as bizarre-looking as that Superpup show may be, having seen it I can say that it was perfectly acceptable children's entertainment. A little...weird, perhaps, but kids can use a little more weirdness in their lives. 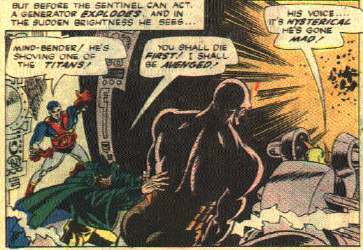 When we last left the Sentinels, Rick, Cindy, and Crunch were in the diabolical grip of the mindbending...er, Mind-Bender, as the mind-controlled Crunch was about to flip a switch designed to destroy their minds! As opposed to simply bending them, I guess. ...a claim he supports by explaining his origin as a scientist caught in an exploding lab, which gave him the power to intermittently control minds. 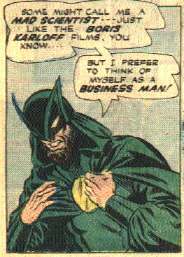 And thus he's a businessman. Sure, that makes perfect sen...wha-huh? 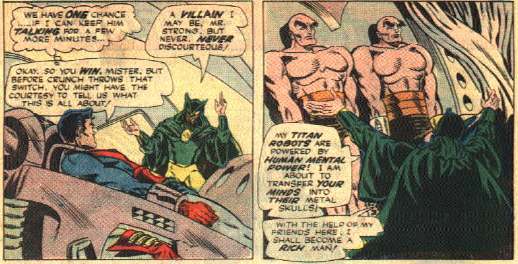 All this time, as the Mind-Bender blabs on and on, prodded on by questions from his captives ("Why do you need robots?" "To do the menial work!" Well, sure), Rick is working at freeing himself. Finally, a day or two later, just as the Mind-Bender has decided he's talked enough, Rick breaks his bonds and grabs some of the power cables on the wall, causing some of the generators in the room to explode, you know, as they do. Luckily, in all this brouhaha Crunch has managed to bust himself free of the Mind-Bender's influence, and thus able to save Cindy's bacon by knocking the falling robot aside with his own body. In the meantime, the Mind Bender has fled for the hills...well, a catwalk actually, high above the action. Rick flies up in pursuit, thinking "with [the Mind-Bender's] uncanny mental power, he's potentially the greatest menace on Earth," which may be overstating things a bit. But hey, he's the superhero, I suppose he knows best. 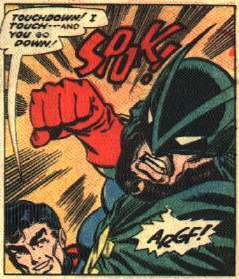 The conflict concludes with Rick delivering a haymaker to MB's jaw, in a panel that contains no end of delights, from Rick's witty bon mot, to that fine sound effect, and even to that grunt of "ARGF!" I want everyone reading this right now to say "ARGF!" out loud, just to hear it. "ARGF!" Rolls off the tongue, doesn't it? Cindy: "That poor man! He was a genius!" Rick: "A twisted genius, Cindy! If he had survived...well, perhaps civilization wouldn't have!" Again, Rick perhaps overstates the case a little, probably to justify the fact that he essentially let a man fall to his doom. Plus, I'm not entirely sure what Cindy did to get herself exhausted, but there you go. Really, the best part of last night's new episode of Justice League Unlimited was the voice-work of fellow Oxnard native Jeffrey Combs as Steve Ditko's The Question. Given Combs' history of playing characters that seem to think they know what they're doing, but very clearly have a screw loose somewhere (see also the Reanimator films, From Beyond , various roles on assorted Star Trek shows), he really added a layer of peculiarity to The Question, who was portrayed as being a little more obsessive and off-kilter than in any of The Question comics I've seen. In fact, there seemed to be just a tiny pinch of Moore and Gibbon's Rorschach, which has the nice touch of a derivative character feeding back into its inspiration. At any rate, this episode, with its conspiracies (or "conspiracy," as the Question says), seeming betrayals, and its portrayal of the Question himself, must be pretty heady stuff for any 8-year-olds tuning in right after last night's Teen Titans cartoon. Now that we've seen the Question, we're perhaps one step closer to getting a Mr. A cartoon: "Mommy, mommy, the man in the cartoon said that reality is independent of our beliefs...what does that mean?" Other observations from the cartoon: I think we just saw the animated origin for Power Girl (given the Supergirl clone's attitute and "cleavage ahoy!" costume). Also, I believe I spotted a Wildcat cameo, which should make you-know-who happy. 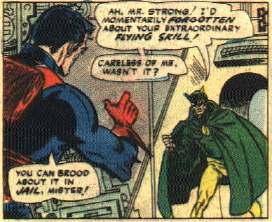 So, all those articles popping up lately about Jim Caviezel playing Superman in the new movie (here's a representative sample)...is Mark Millar pretty much the only source for this rumor? Well, at the very least, Millar knows how to get people talking about him...including me, I suppose. In response to someone in the comments section of my previous post -- I don't have a cover scan for Marvel Comics' Life of Pope John Paul II immediately available, but you can find images of varying quality on eBay. And go enter Johanna's Fallen Angel contest, gosh darn it. Don't make me tell you again. This is an archive page for the old Blogger version of Progressive Ruin, kept around to maintain all the old permalinks. Please visit the main page for the current version of this site. Thanks for visiting, and sorry for the inconvenience! Copyright © 2003-10 Mike Sterling. Some images used are copyright © their respective copyright owners.